Almost every medical faculty possesses anatomical and/or pathological collections: human and animal preparations, wax- and other models, as well as drawings, photographs, documents and archives relating to them. In many institutions these collections are well-preserved, but in others they are poorly maintained and rendered inaccessible to medical and other audiences. This volume explores the changing status of anatomical collections from the early modern period to date. 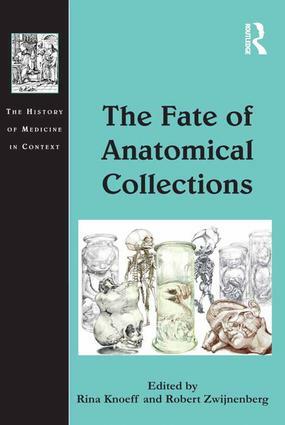 It is argued that anatomical and pathological collections are medically relevant not only for future generations of medical faculty and future research, but they are also important in the history of medicine, the history of the institutions to which they belong, and to the wider understanding of the cultural history of the body. Moreover, anatomical collections are crucial to new scholarly inter-disciplinary studies that investigate the interaction between arts and sciences, especially medicine, and offer a venue for the study of interactions between anatomists, scientists, anatomical artists and other groups, as well as the display and presentation of natural history and medical cabinets. In considering the fate of anatomical collections - and the importance of the keeper’s decisions with respect to collections - this volume will make an important methodological contribution to the study of collections and to discussions on how to preserve universities’ academic heritage. Rina Knoeff is a University Lecturer at the Faculty of Arts at the University of Groningen. She is particularly interested in the cultural history of medicine and chemistry. Previous work has centred on the Boerhaave school and on early modern Dutch anatomy and anatomical collections. Robert Zwijnenberg is Professor of Art and Science Interactions at Leiden University. He has published on Renaissance culture and art theory, philosophy of art, and on the relation between the arts and the life sciences. Zwijnenberg is one of the founding directors of The Arts and Genomics Centre.